Although Rathlin Island is not on the Causeway Coast Way, it is an excursion many walkers add to their Antim itinerary. In addition to the genuine feeling of isolation from the rest of the world, the abundance of wildlife makes the visit one to remember. 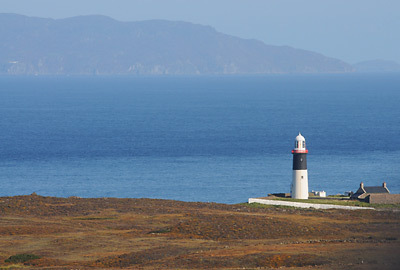 Rathlin is Northern Ireland's largest off-shore island. Each corner of the L-shaped island has a lighthouse with a total distance of 12km when joining them up. The three main way-marked trails on the island roughly correspond to visiting each lighthouse. The trail to the West Lighthouse simply follows the road. The RSPB ('Royal Society for the Protection of Birds') set up a Seabird Centre here during summer months to observe the large colony of over 10,000 birds. Staff help visitors in identifying around 30 different species of bird with binoculors. The more popular of these include puffins, gannets, guillemots, razorbills and fulmars. On the way out to the East Lighthouse, there is a turn-off for the 'Ballyconagan Trail'. On this National Trust property, an off-road path leads up to an old coastguard hut. This was a lookout point for invaders during World War II but is more suitable for watching wildlife these days. The surrounding heath is habitat to meadow pipits, skylarks, reed buntings and linnets. The trail also passes the ruins of the Croghnanagh settlement which was a small farming community and their preserved traditional field system. The road to the South Lighthouse has a turn-off that leads to a cliffside walk called the 'Roonivoolin Trail'. This RSPB site was recently set up to help reintroduce the red-billed chough to Northern Ireland. Corncrake, lapwings and snipe also benefit from this sanctuary and other birds such as buzzards and peregrine falcons can be spotted here. Further along the trail	, a seal colony can often be found basking on the rocks at Ushet Port, just before reaching the destination of the lighthouse on Rue Point. To properly visit all three corners of Rathlin Island on foot takes a little more than a day. If planning to catch the return ferry on the same day, it is wise to commit to walking just one trail. Alternatively, it may be possible to pre-book a bicycle from the Soerneog View Hostel. If you want to stay overnight on Rathlin to walk all three trails, it is worth noting that accommodation is limited and bookings should be made well in advance.